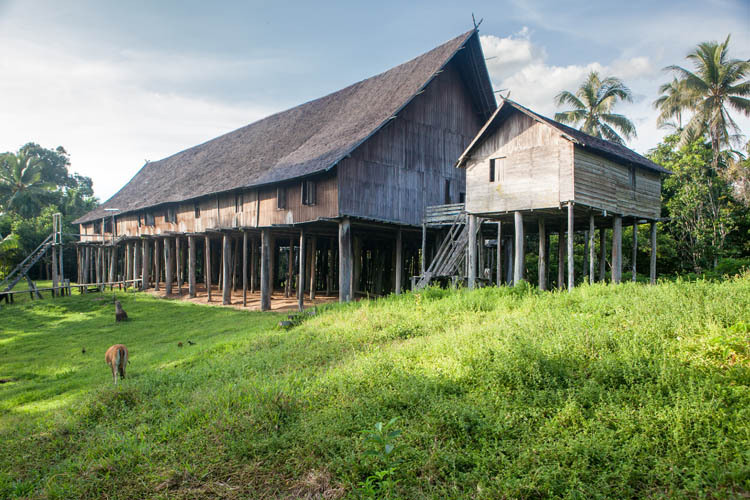 Last week, accompanied by our wonderful Dayak guide Dodi (and ’trainee’ guide Jonathan) we travelled up to see the longhouse (betang) at a little village called Tumbang Gagu, right up in the headwaters of the Sampit (or Mentaya) River. They don’t get a lot of foreign visitors there – we checked the guest registration book and last year they had one group of three French people in May, and … no-one else all year. 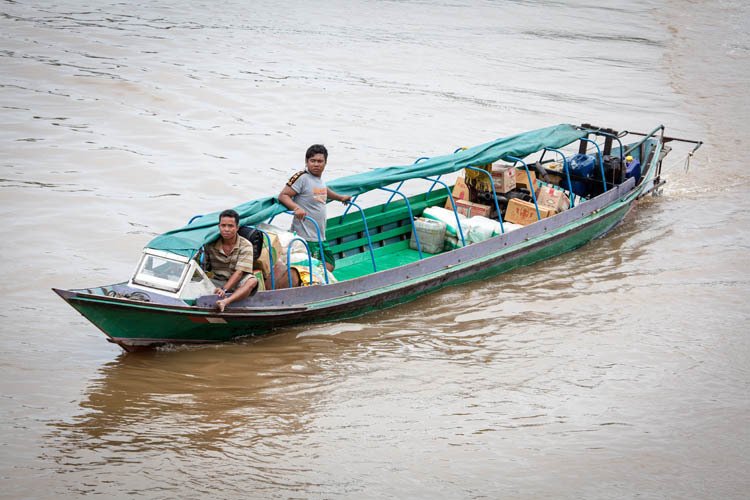 In part, that’s because it’s a bit of a journey to get there: a three hour drive to Tumbang Samba on the Katingan River, a six hour journey upriver from there via klotok (motorised canoe’ like the one above), and then a two hour walk through the forest to Tumbang Gagu. In Tumbang Samba we stayed overnight in the Losmen Itah – the best (well the only) accommodation in town. From the upstairs balcony you can see Bukit Raya in the distance – it’s the highest mountain in the Indonesian part of Borneo. It’s even harder to get to – but one day we hope to make the 10+ day journey. The walk through the forest was pleasant, and there was a chorus of birds all the way. Rattan vines hang over the path in places to create a little hazard, trying to grab on to your clothing or even remove your hat as you pass by. The forest here was mostly bamboo, and really muddy and slippery in places. We didn’t meet any other people along the way, and were more than a little steamy and sweaty by the time we arrived in the metropolis of Tumbang Gagu (population? “70 families”). 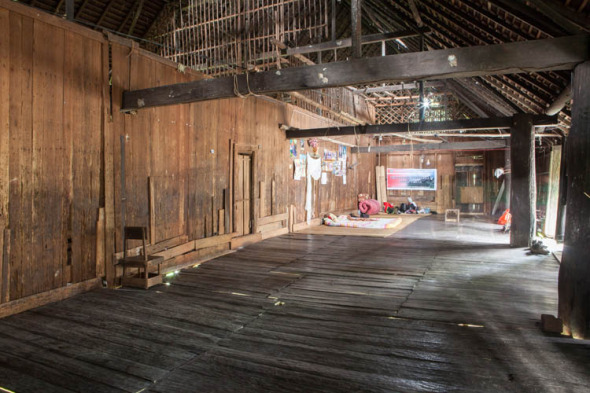 The betang at Tumbang Gagu was built in 1870 (though it took seven years to complete). 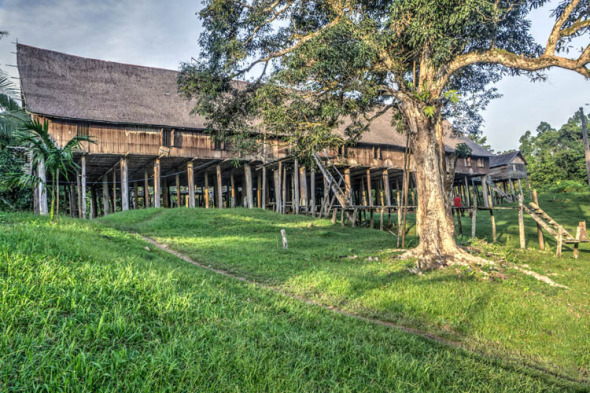 It’s almost entirely built out of kayu ulin (ironwood – a wonderful hard, even-grained, decay-proof and termite-proof timber, which is so useful that it has now almost entirely disappeared from the forests). 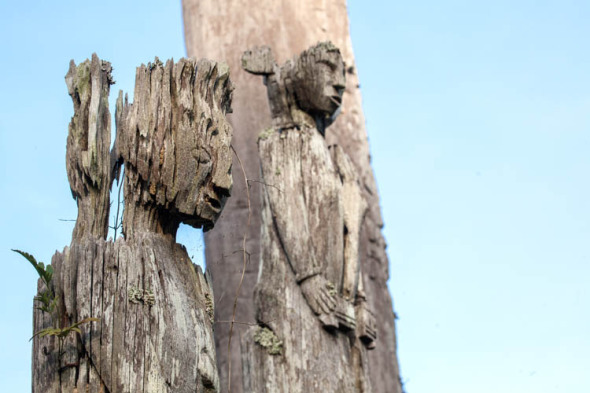 The betang is 55 metres long and stands on pillars some 5 metres high. 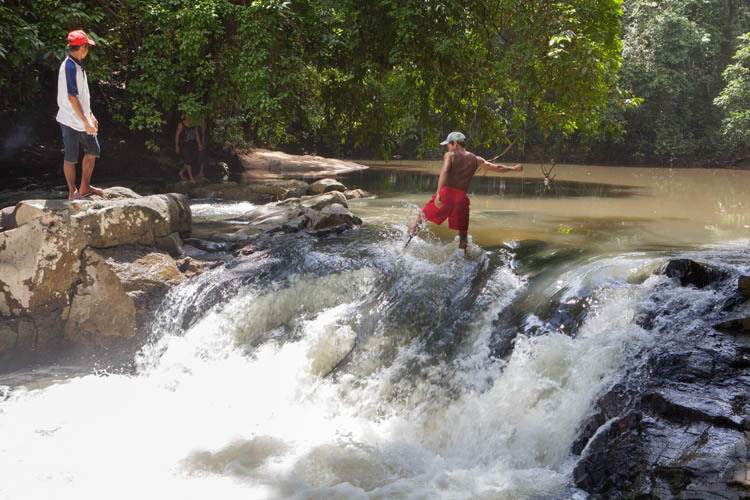 You get up to it by climbing a log with notched steps cut into it (hejan), which can be as hairy as it sounds. The steps can be pulled up and the betang becomes pretty much inaccessible. According to a label in the Museum Balanga, this design is intended to protect the occupants from “wild animals and bad-mannered people” – a nice euphemism for the former practice of head-hunting! Inside it’s divided into several very large rooms (it originally housed six families). We stayed there four nights, and that’s our sleeping quarters in the photo above. It’s woody and creaky and supposedly full of spirits. But to me it felt for all the world like the inside of a big old shearing shed. 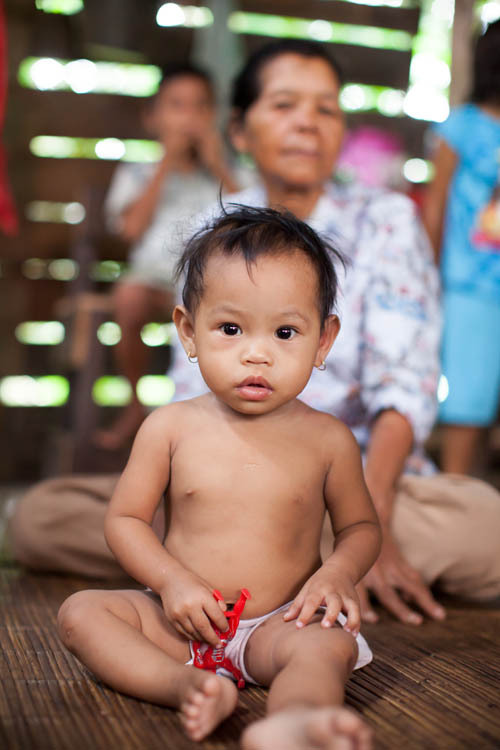 Only Lery (who as a trained nurse is the only medical care for five villages in the region) and her mother Ibu Silei live permanently in the betang. But other members of the broader family regularly stay there – one night there were a dozen or more sleeping there. 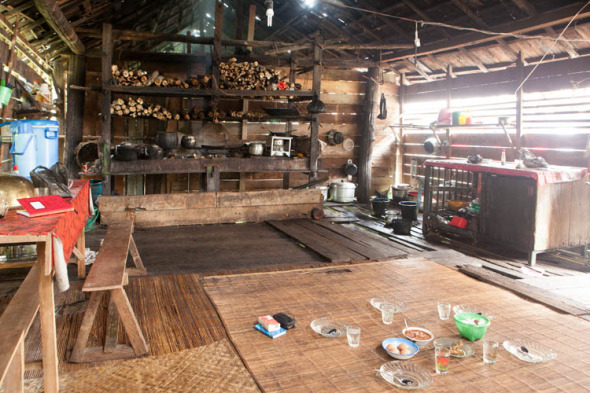 The kitchen is in the typical simple Dayak style, but manages to produce a steady supply of meals from food grown in the slash-and-burn gardens or collected from the forest. Snack foods are about the only foods brought in from other places. 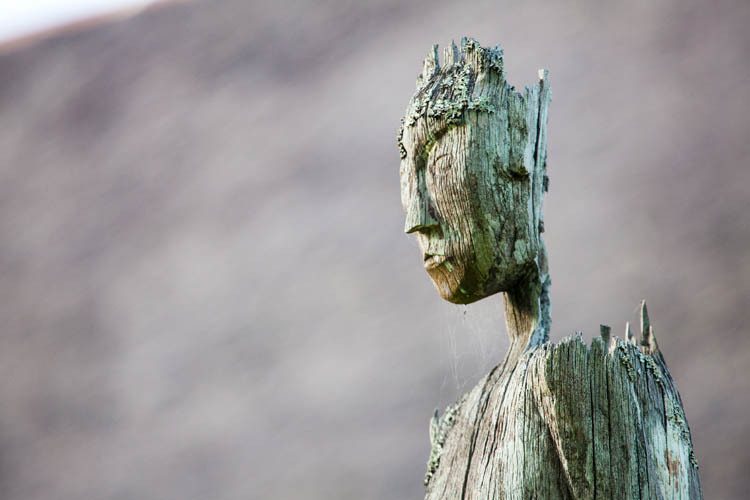 Out in front of the betang are several beautifully weathered wooden statues. Each one is about four metres high. 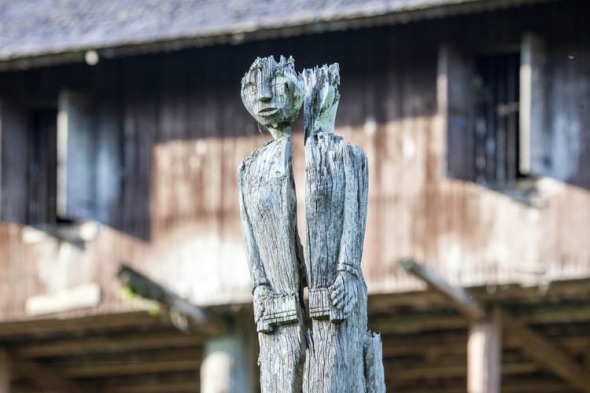 These sapundu were constructed for some long-ago tiwah funeral ceremonies. They now stand with an austere grace like guardians watching over the river. We had some really interesting excursions over the days we were there. 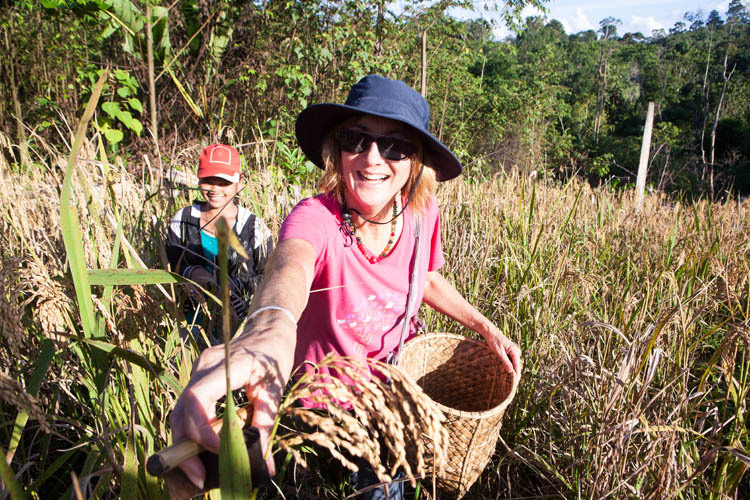 One day we went out into a trackless part of the forest to check on several traps set for wild pigs (babi hutan). Didn’t get any, but we did learn how to make simple (but very effective!) animal traps. 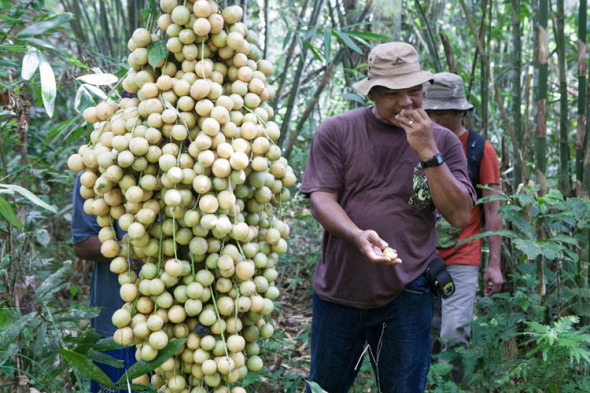 And on the way we got to sample some wild jungle fruits. We spent a couple of hours with a gentle man who wanted to show and explain his prized collection of Dayak weaponry, including a spectacular mandau (sabre) and various spears and a blowpipe and poison dart container. The mandau was particularly interesting. The various objects that hang off it give the wearer special powers and protections (including, handily, making you invisible to your enemies). 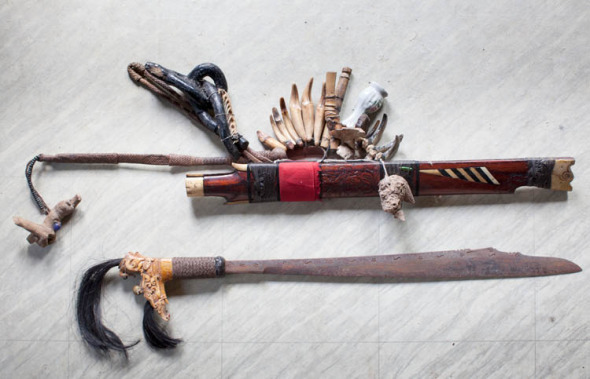 There are bear claws, an orang-utan tooth, babi hutan tusks, a snake jaw, a jar of magical oil from his grandfather, and two tufts of human hair, apparently obtained during the Sampit ‘disturbances’ in February 2001, during which at least 500 Madurese were killed. 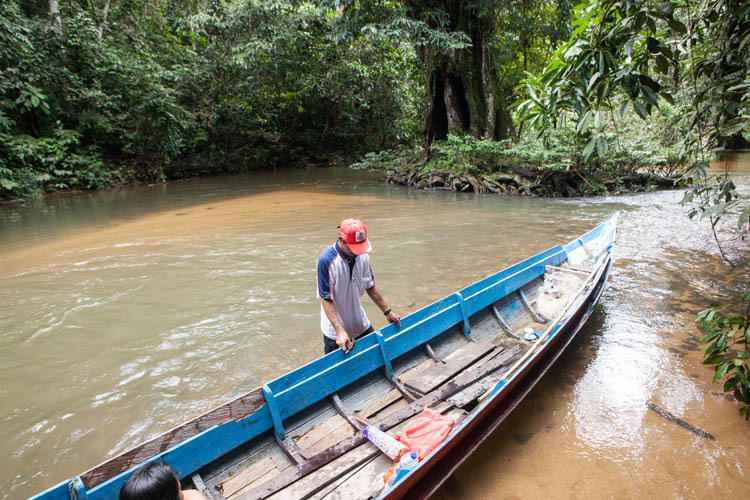 One day was spent going by canoe (klotok) for two hours up the Kalang River past the last village of Jembatan Kalang as far as can be navigated to the cascades at Maraku. There our crew (Rodi and Obi) used a net to catch some little fish which we barbecued for lunch, and then we cooled down under the waters of the cascade. There is some real Jurassic Park forest on the way up there, and we saw proboscis monkeys and hornbills in the trees above us. In other places however it is a landscape being badly scarred by the illegal gold dredging that continues unabated along all of these rivers. On the way back we hit one rock too many in one of the rapids, and our klotok cracked all the way down one side and immediately started taking in lots of water. It only took Rodi and Obi about 20 minutes to effect repairs, using scavenged timber, plastic bags and bits of discarded clothing, a hammer and some recycled nails. We had to bail out a few times, but they got us (and our cameras!) home safe and dry. Back at the betang, Karen bonded with Lery’s one-year-old niece. Her family really liked seeing the two them smile at each other. The baby is to be christened next month. And the name that has been chosen for her? “Karen Meilin”. That’s good – the world needs more Karens. This entry was posted in General and tagged Central Kalimantan, Dayak Ngaju, Kalimantan Tengah, mandau, Tumbang Gagu, Tumbang Samba. Bookmark the permalink.